(VEN) - Ha Long City in the northeastern province of Quang Ninh is facing environmental problems due to the growing number of visitors drawn by its world-famous emerald waters and thousands of towering limestone islands. The number of visitors to Ha Long has increased yearly to reach 3.14 million in 2016 (up 22 percent from 2015) and 3.92 million in 2017 (up 24.7 percent from 2016). 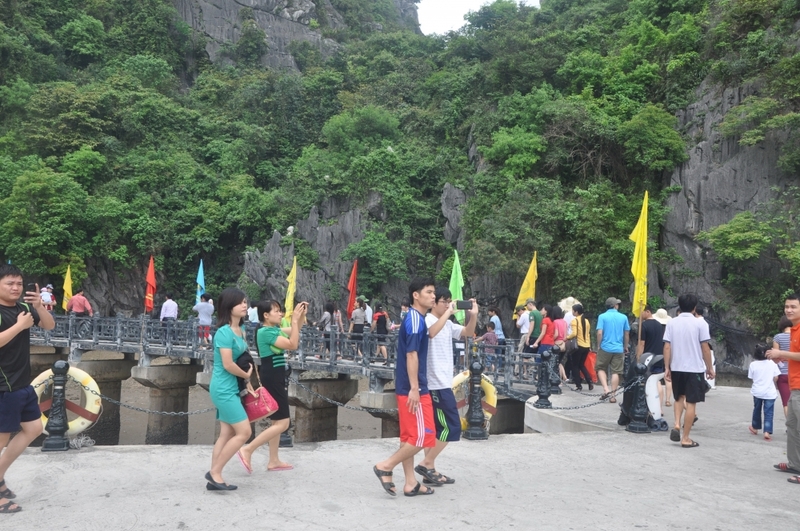 Almost 29,000 people visited Ha Long Bay daily during the peak season so far this year, creating growing pressure on the world heritage preservation site. Ho Quang Huy, Deputy Chairman of the Ha Long City People’s Committee told Vietnam Economic News that the committee has worked with the Ha Long Bay Management Unit, the Vietnam Tourism Association (VITA), the provincial departments of transport and tourist, and vessel associations to improve the community’s awareness of environmental protection. It also exchanged information with neighboring localities such as the northern port city of Hai Phong’s Cat Hai District and worked with fleets to better visitor management. Ha Long City told relevant units and coordinated with the Ha Long Bay Management Unit to review and update the number of boats operating on the bay in order to build tourist boat management software. Boat owner information, including name, boat number and image will be found on the city’s website and fan page. Pham Dinh Huynh, Deputy Head of the Ha Long Bay Management Unit said there are 505 tourist boats with a total capacity of about 21,500 seats operating in Ha Long Bay. The bay management unit asked boat owners to install fire prevention and protection equipment and cameras on their boats. Captains and crew members violating the law and causing accidents risk temporary suspension or a permanent ban by the bay management unit. Ha Long City People’s Committee Deputy Chairman Ho Quang Huy said he would propose developing tourist attractions to ease pressure on the bay’s core area, ensure a balance between tourism development and environmental protection, and intensify cooperation in visitor demand surveys on expanding the tourist space and building green tourist offerings. In addition, Ha Long will implement the recommendations of the United Nations Educational, Scientific and Cultural Organization (UNESCO) on the convention for protection of world cultural and natural heritage sites, which Vietnam joined in 1987. It will also provide the Quang Ninh Province People’s Committee with suggestions on preparing Ha Long Bay environment protection plans to 2020 with a vision to 2030, and build more wastewater treatment facilities.